I don’t know how to stay happy and shop for food on a budget. I hate coupons and the circulars give me a headache. I also require variety in my meals or else I’ll waste money by ordering in. These are my truths. I’ve tried to save money by buying only one type of meat each week and creating new meals around, say, 7 days worth of tilapia. But by day three I’d always rather move back home than cram one more fistful of lemon soaked fish into my mouth. Unfortunately, I also can’t swallow spending more money just to give myself a variety of pork, chicken, and beef each week. As a compromise to satisfy my thin wallet and irritable taste buds, I continued to buy one package of meat a week (along with tuna fish for lunches) while splurging a bit on a large variety of produce. Tomatoes, spinach, lettuce, onions, garlic, peppers, cucumbers, carrots, string beans, mushrooms and zucchinis were used each week to liven up my dinners, lunches and morning eggs. At first it seemed like a great solution, but eventually I was spending just as much each week as I would have had I just bought the meats I wanted. Fortunately, life handed me an easy solution. My company paired with a local farmer’s market, Stony Hill Gardens, in order to help reduce everyone’s weekly shopping bill. 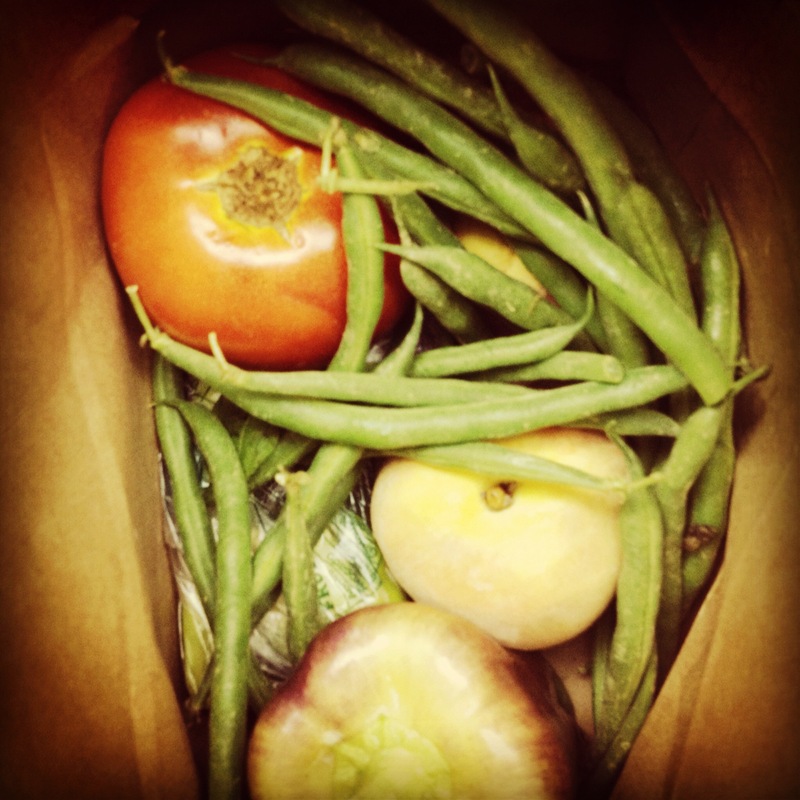 For $115.50, I receive a delivery of fresh produce to my office every week for 14 weeks. This equals $8.25 a week for produce. What I most like, other than the overall savings, is that you never know what you’re going to receive until the day before. Since the veggies and herbs change every Thursday, I’ll have the opportunity to test out meals and taste new veggies that I would have never otherwise tried. This week we received string beans, cantaloupe, peaches, garlic, bell peppers, sweet purple bell peppers and eggplant. Since I split my share with 3 other coworkers (each paying the initial $115.50 fee), we have to divvy everything up and compromise on some products. For instance, I didn’t take home any of the eggplant today because I think I hate eggplant, and I left the garlic to another because I have too much garlic at home as it is. I didn’t get enough to last me an entire week like I had originally hoped, mostly because I eat veggies like a monster, so I’m going to curb the amount I’m eating and try to stretch what I do have as far as possible. My weekly requirements are simply lettuce, onions and garlic, so if I only buy those and leave the rest of my greens to my weekly delivery, I’ll still be saving at least $20 a week. Farmers’ Markets are a great way to support local farmers while also supporting your bottom line. I’ve always been a huge fan, but found it impossible to make the time to visit the one twenty minutes from my house. Having the market deliver to me for so cheap is beyond reality, but I bet a lot of local growers would jump at the opportunity to make money off of a big office filled with lazy shoppers, so long as you had enough buyers to make it worth their time. I suggest looking into your local farmers and seeing if any are interested in dropping their weekly crops off to your business. It’ll put more money in their pockets while preserving your own.